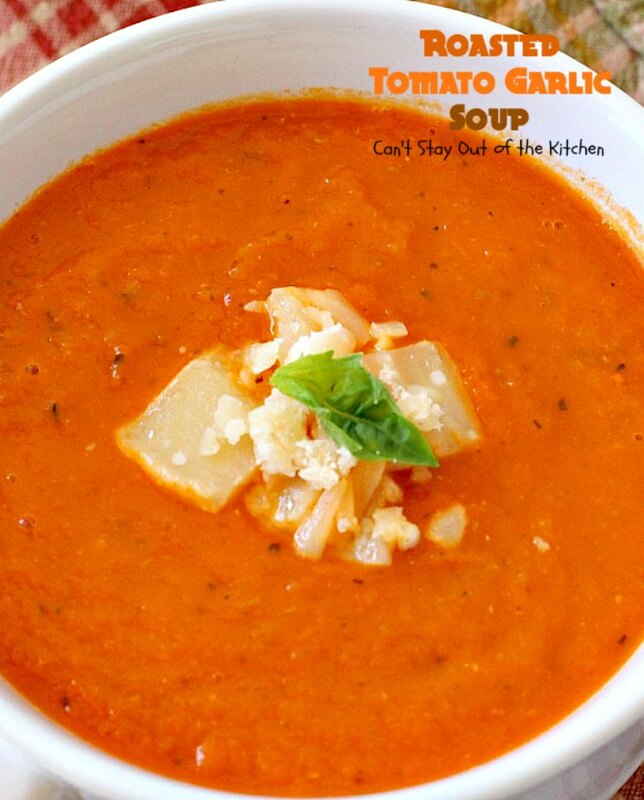 I love Roasted Tomato Garlic Soup. Quite frankly, roasting vegetables before adding them to soups is the way to go. They sure increase flavor. I roasted a whole bulb of garlic along with the tomatoes, leeks, carrots, celery and onions for this recipe. The roasted garlic infused the recipe with a delicate flavor that was marvelous. I roasted the veggies with lots of fresh herbs like basil, oregano, thyme and rosemary. 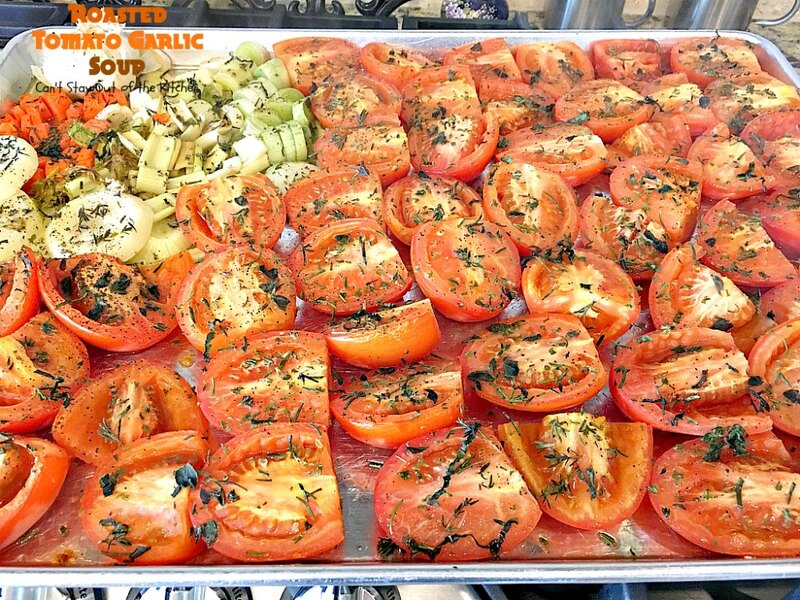 The herbs permeated the veggies while roasting so they increased in savoriness. Mouthwatering comfort food–YES! 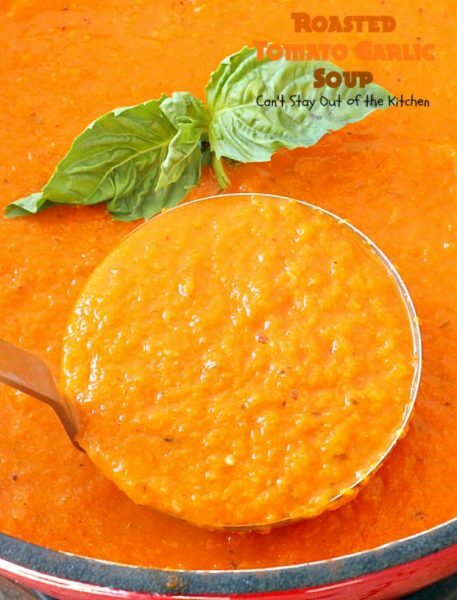 When making the soup, I added low-sodium tomato juice, tomato paste, bay leaves and red pepper flakes to increase taste. Then I served the soup with my favorite Homemade Gluten Free Croutons and garnished it with extra thyme and basil. The recipe is vegan this way (assuming your GF bread is also vegan). 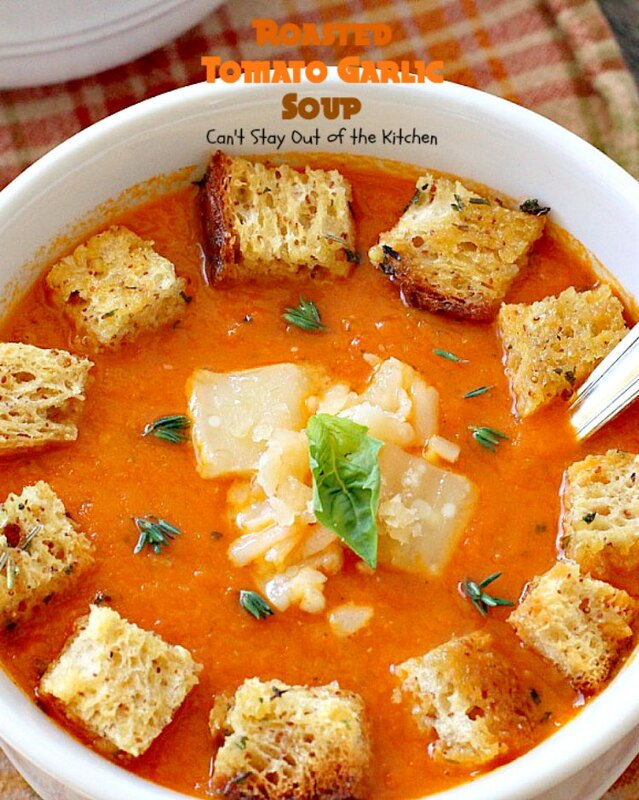 But if you can eat dairy, this soup is excellent garnished with fresh parmesan cheese shavings. I also melted mozzarella cheese on to gluten free bread and made my own homemade cheesy bread sticks or dippers. Yes, I couldn’t get enough of this soup. 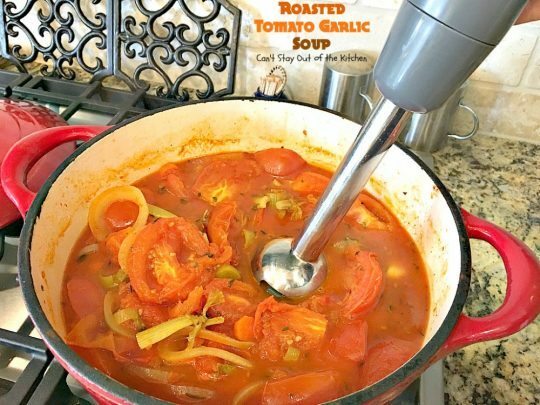 If you’re looking for heavenly comfort food this winter, Roasted Tomato Garlic Soup is a recipe you should try. It’s healthy, low calorie, gluten free and vegan if you omit the parmesan cheese for a garnish. 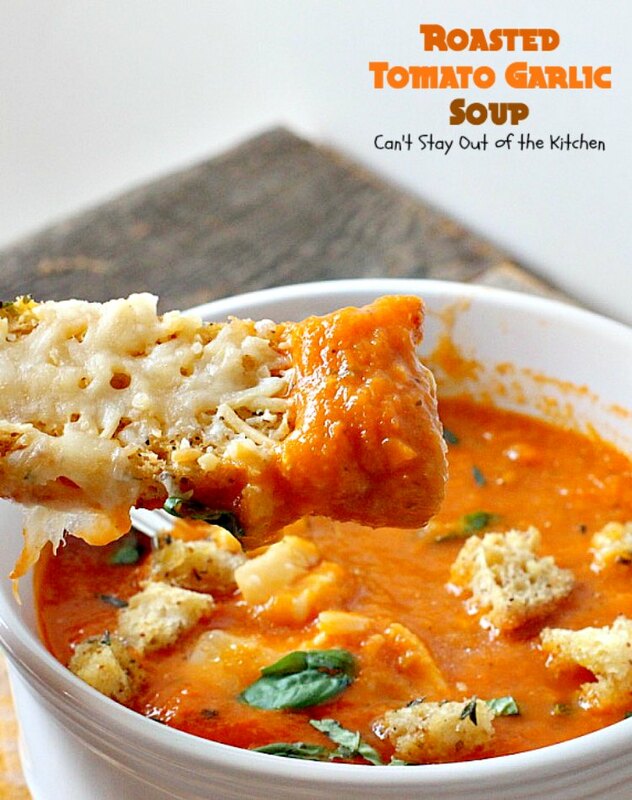 If you’re a tomato soup lover like me, this is one of those recipes you won’t be able to get enough of. I’m ready to make another batch now! Roasted Tomato Garlic Soup is amazing comfort food. 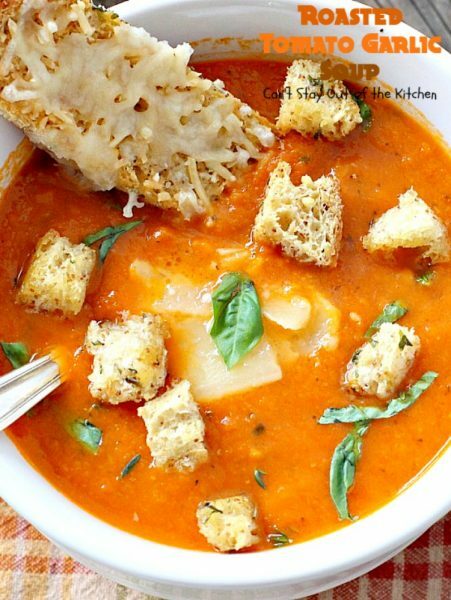 Garnish soup with fresh basil, thyme, parmesan cheese and Homemade Gluten Free Croutons, if desired. 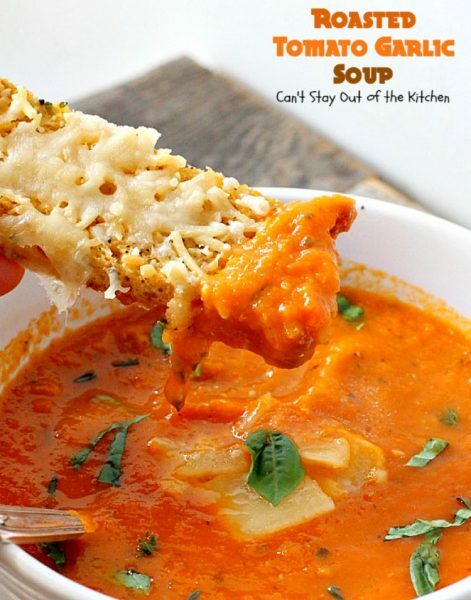 Omit the parmesan cheese for garnish if you want to keep the soup vegan. I used these ingredients. 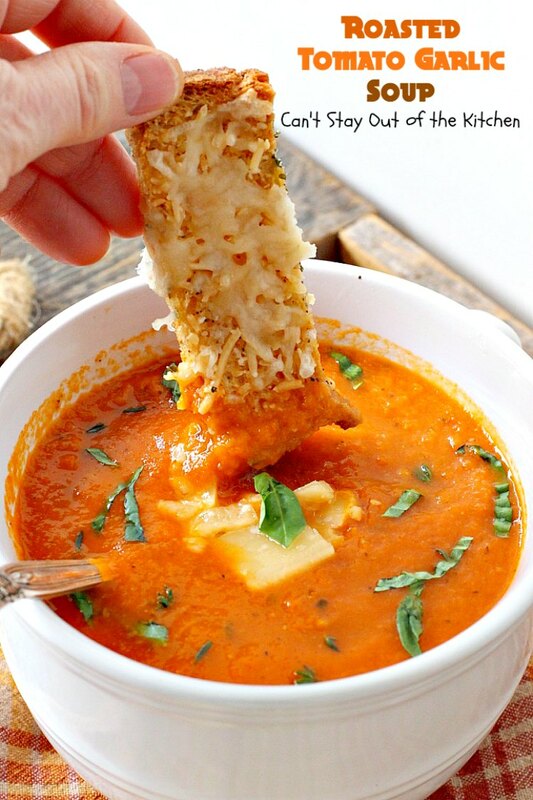 If you want to keep the soup vegan, omit the parmesan cheese for garnish. 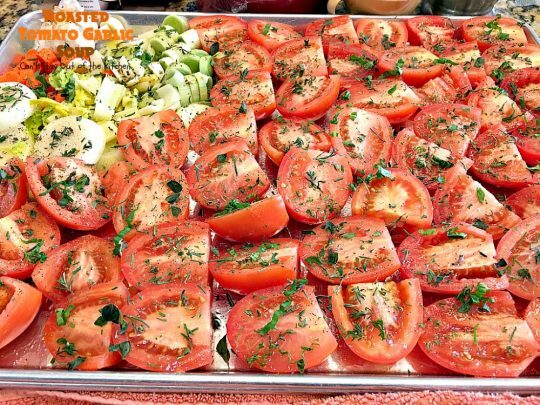 Slice roma tomatoes in half place on a large cookie sheet. Add diced onions, sliced leeks and carrots. Cut the top off a whole bulb of garlic. Brush veggies with olive oil. Sprinkle generously with salt and delicately with pepper. Add freshly minced thyme, basil, rosemary and oregano. Add dried parsley. Roast at 400 degrees for 30-45 minutes until veggies are tender. 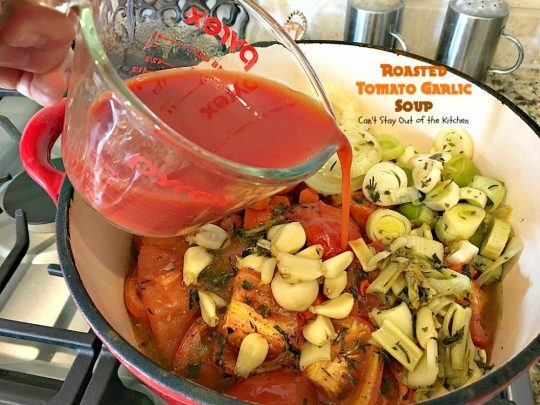 Pour veggies including all drippings into a large Dutch oven or stock pot. Add low sodium tomato juice. Add tomato paste, red pepper flakes and bay leaves. Cover with lid and cook through about 15 minutes. Turn off heat. Remove bay leaves. Puree ingredients with an immersion blender until creamy smooth. Garnish soup with fresh basil, thyme, oregano, rosemary or parsley, as desired. Here’s a ladle full of soup. 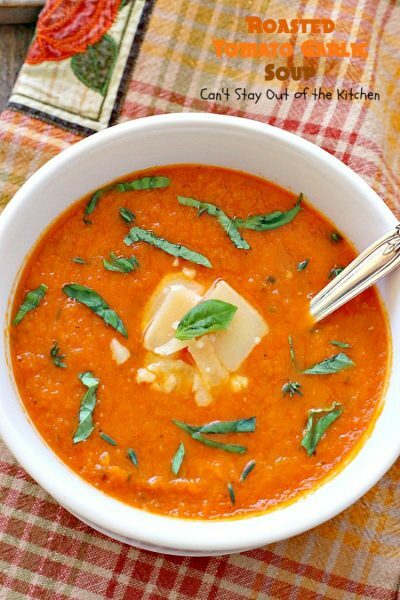 This nourishing soup is good for whatever ails you! It’s totally filling, satisfying and great reheated as leftovers. I have to admit I LOVE these homemade croutons. They make everything taste wonderful! I eat them in salads and soups all the time. Roasted Tomato Garlic Soup was wonderful served with my own homemade cheesy breadsticks! This savory soup is roasted with all kinds of veggies & a whole garlic bulb. 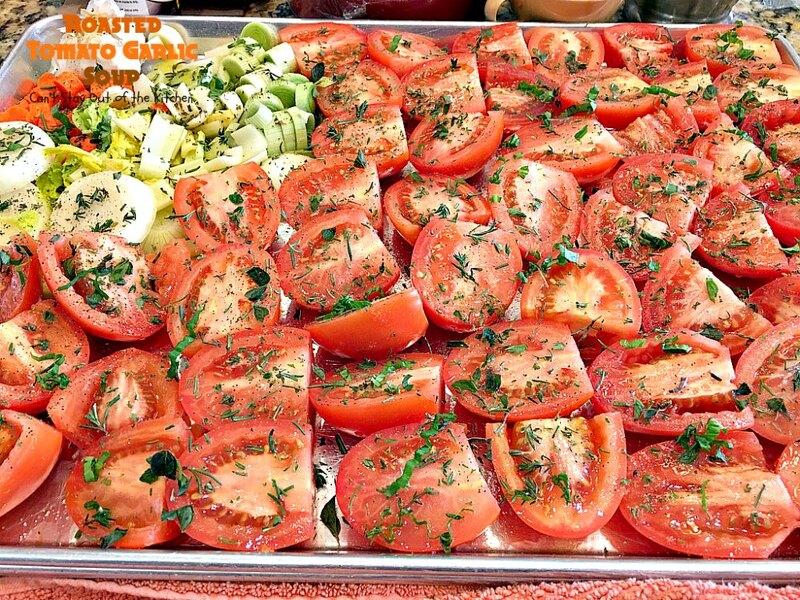 Fresh herbs infuse the tomatoes and veggies with extra flavor. Gluten free and vegan if you omit the parmesan cheese for garnish. Spray a very large cookie sheet with olive oil cooking spray. 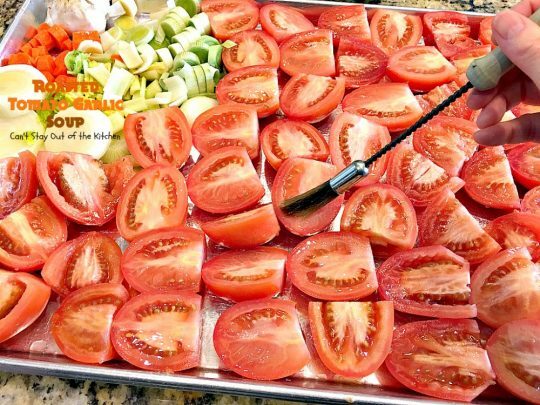 Wash and slice tomatoes and layer on cookie sheet. Cut off the tip of the garlic bulb exposing the garlic. Place on cookie sheet with sliced onion, celery, carrots and leeks. 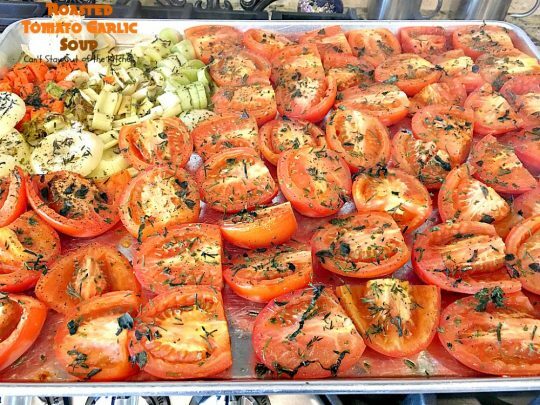 Brush olive oil over top of all the veggies and tomato halves. Sprinkle salt evenly over the tomatoes and veggies on the cookie sheet. Sprinkle very delicately with pepper. Add parsley, oregano, thyme, rosemary and basil. Bake at 400° for about 30-45 minutes or until veggies are tender and roasted. 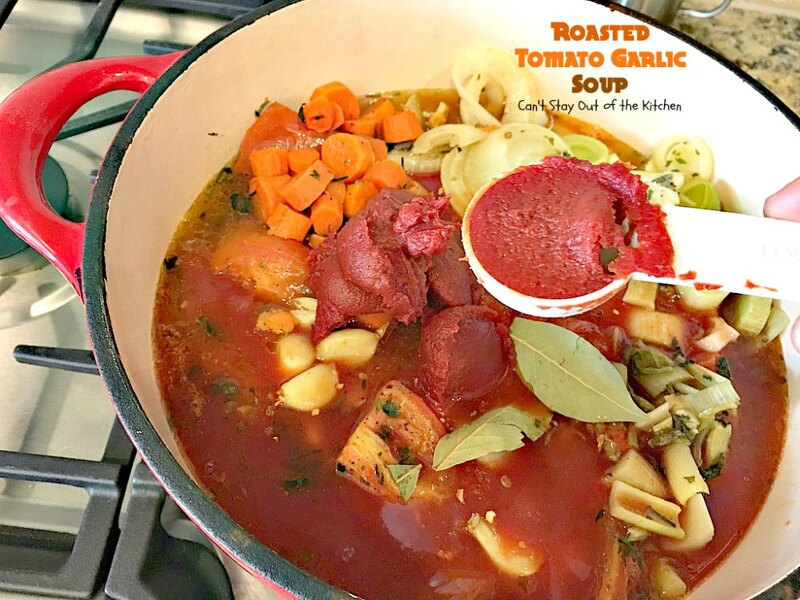 Place roasted tomatoes, veggies and all the drippings and herbs into a large stockpot. Add tomato juice, bay leaves, red pepper flakes and tomato paste. Cook through about 10-15 minutes. Serve with homemade gluten free croutons or bread sticks. NOTE: My favorite gluten free bread is Canyon BakeHouse 7-grain. It's the BEST gluten free bread I've tried. Many others are dry and crumbly, but not this delicious gluten free bread. It makes wonderful Homemade Gluten Free Croutons. Every bite of Roasted Tomato Garlic Soup will have you drooling! 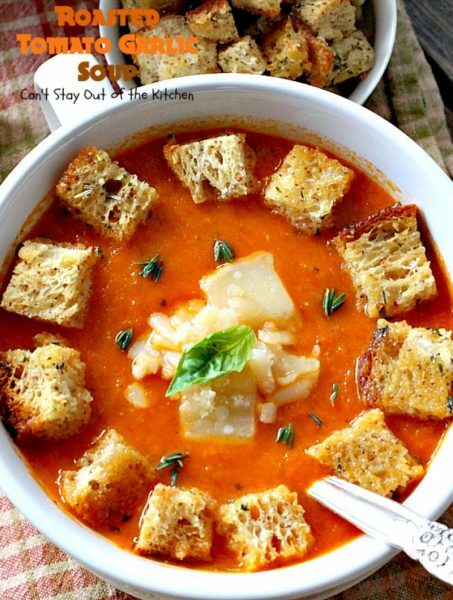 If you enjoy hearty soups on cold winter nights, you’ll love this healthy, low calorie, gluten free and vegan soup. I’m going to make this today! Question: I’m assuming that you didn’t puree the whole garlic bulb, but squeezed out the roasted garlic and tossed the outer part. Is this correct? 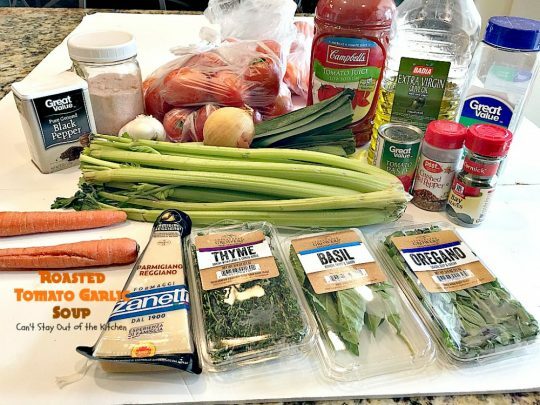 Hi, Trish, I squeezed out the garlic and then when I pureed the ingredients only the garlic was pureed (not the skins or anything). Hope you enjoy it! Teresa–this does look like “heavenly comfort food!” –especially with all the rainy weather we’ve been having. Love all the veggies and so many spices in the ingredients. Looks luscious! thanks. 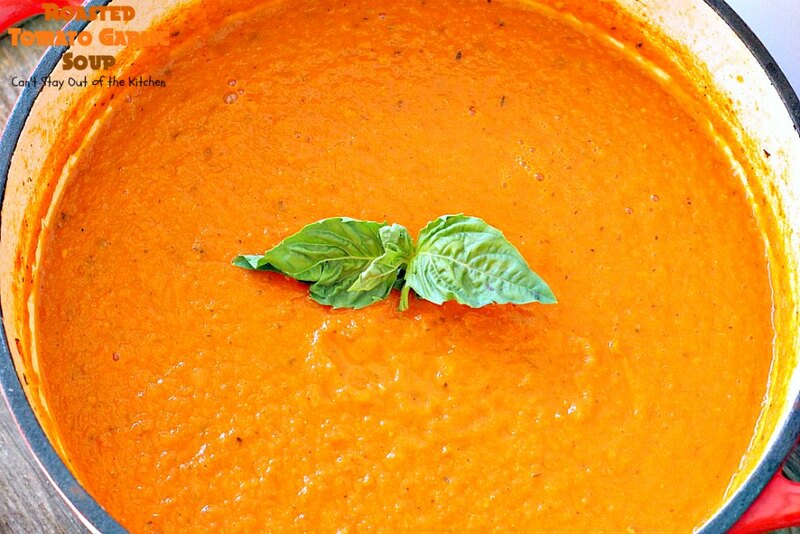 I have always wanted to try cooking homemade tomato soup. This looks delicious! Thanks, Joanne. It’s really tasty.